Filipe Toledo Repeats, Now Leads The Rankings. 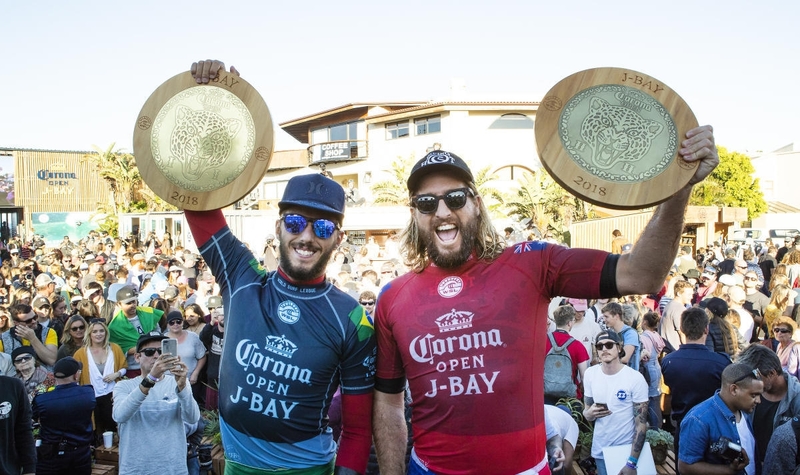 After four days of unrelenting action, the Corona Open J-Bay - Men's came to a close Thursday afternoon with Brasilian superstar Filipe Toledo taking the win for the second year in a row. Toledo was a clear standout throughout the week -- putting up five of the 10 highest heat totals. And while Julian Wilson -- the former World No. 1 -- made it to the Quarterfinals, Toledo will be taking hold of the Jeep Leader Jersey for the second time in his career. "I'm excited. I like yellow," Toledo said of the news. The 23-year-old did not have an easy ride, matching up against fellow Brasilian Gabriel Medina in the Quarterfinals. While Medina was showing flashes of brilliance, earning an 9.10, he was unable to find a substantial backup score. Toledo powered through, earning two scores in the excellent range for a 17.50 heat total. His speed went unmatched and the judges took notice. Despite the Quarterfinal exit, Medina will be leaving South Africa ranked No. 3 in the world. In the Semifinals, Toledo went up against Kanoa Igarashi, who surfed the best he has all season. The Japanese surfer from Huntington Beach hacked his way to numerous high scores, taking down a few heavyweights along the way. Before his heats, Igarashi's energy was palpable and a lot of times his coach would attempt to calm him down. But Toledo was unstoppable, earning a massive 18.90 heat total (9.57 + 9.33). Gone are the days where long, drawn- out lines dominate Supertubes. Filipe Toledo decides what dominates Supertubes. "Toledo in the Semifinals -- that's probably the best I've ever seen anyone surf," said former World Champion and South Africa native Shaun Tomson. For the second time this year, Toledo went up against rookie Wade Carmichael in the Final. Toledo has never lost a Final in his career but Carmichael put up a solid fight, earning an 8.00 early in the game. Unfortunately for Carmichael, Toledo's relationship with Supertubes is undeniable. While visibly tired and fatigued from his previous Semifinal heat, Toledo managed to push through, scoring both an 8.50 and an 8.30 for the Final win. "To be honest, I'm so tired right now," he said after his win. "I was trying so hard to push through that heat but there were a few times that I just had to stop for a minute. I have so many crazy emotions. I feel like it's my turn now. Everything is clicking and feeling good. At this point I'll do whatever it takes to win the heat, whether that's running on the rocks or breaking my board. My plan was to come here and come out on top and I'm glad I was able to do that."